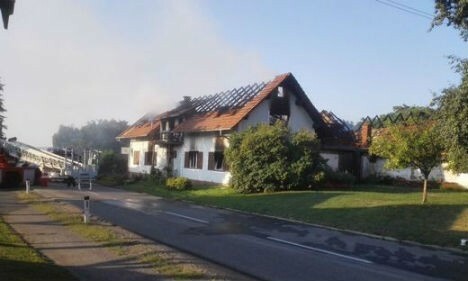 A man and his two grandchildren, aged eight and ten, have died after his house caught fire in Kroisbach an der Feistritz in Styria.The children’s mother, grandmother and their two-year-old half-brother were saved from the burning building on Thursday night. Witnesses said that their neighbours helped them escape using a ladder. They suffered minor smoke poisoning and are being treated in hospital. A spokesman for Ilz police service said that firefighters had first recovered the man’s body from the house. They did not find the dead siblings, a boy and a girl, for some time but after a long search discovered them in the attic on Friday morning. The children’s father was not in the house at the time. The fire department received an emergency call from the family’s neighbours at around 3am and 140 firefighters were sent to fight the blaze. The roof of the house had collapsed and an adjacent farm building was also badly damaged by the fire. “It’s sad. When we arrived the fire was at full strength. We tried to save what we could but we were not able to enter the house for some time,” chief firefighter Josef Rath said. The house had a Buschenschank, or wine tavern, in the ground floor. It’s unclear at this point what the cause of the fire was.